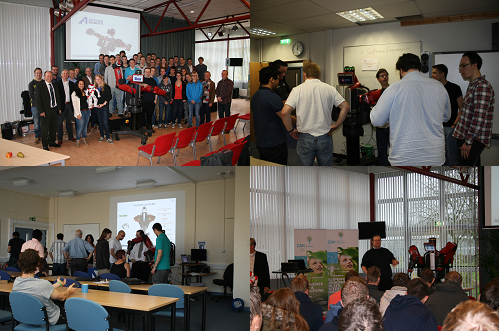 Active8 Robots are now offering lectures on collaborative robotics to all Universities and Colleges in Europe! As part of National Robotics Week Active8 Robots will be delivering a series of lectures on collaborative robotics via Skype to students across Europe. Most Universities have nothing within their current syllabus on collaborative robotics so we’ve decided that to drive further interest in the field of collaborative robotics through our commitment to education and industry we will provide these lectures at no charge. Traditional industrial robots have been around for a number of years but have provided few opportunities and sparked little interest in students to pursue a career in industrial automation. However, with the collaborative robotics revolution there are an increasing number of employment opportunities for graduates and industries are now starting to realise the true potential that collaborative robots present. By working with industry partners and Universities we hope to provide students with the best possible education so that they can be at the forefront of the collaborative robotics revolution that is going to change manufacturing in the Western World. Through utilising low cost collaborative automation robots like Baxter and Sawyer, manufacturers can increase flexibility and productivity to reduce the need to offshore and keep their domestic workforce. Modern power tools like Baxter and Sawyer can actually lead to a growing trend of reshoring where workers are empowered to become more productive and more highly trained. Now more than ever there is an increasing focus on STEM subject education, particularly with regards to encouraging the participation of girls and young women, and from our experience we’ve found that robotics is an area which attracts all students to STEM based education. Want to arrange your free lecture? We can arrange a free Skype lecture to show you why smart, collaborative robots are the future for European manufacturing.